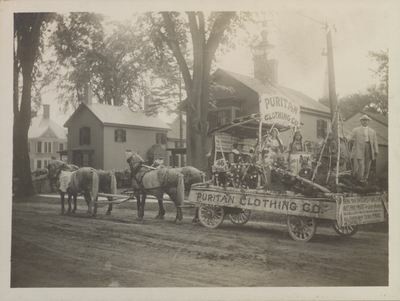 "The Puritan Clothing Co. Bangor Carnival Parade Float, June 18, 1912"
The Puritan Clothing Co. operated at 46 Central Street. D.P. Mulvey served as manager. The 1912 Bangor city directory does not specify what D.P. stood for. The sign on the back of the float reads, "Bring your envelopes to our store / Get free prizes for lucky numbers / Baseballs bats waists trousers games / All given away to-day free! / 46 Centra St. near Kenduskeag Stream"